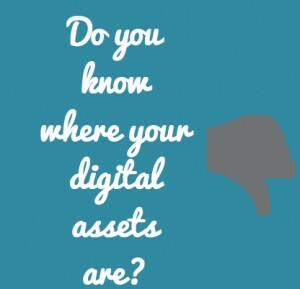 What are your digital assets in your life? More than ever, we are leaving behind a digital footprint whether it is in images, passwords, digital notes, different accounts and the list just goes on. Some social media platforms and online software programs have extensive ‘Terms and Conditions’ that the majority of the population doesn’t read them. Have you ever read the entire iTunes (Apple ID) Terms and Conditions which amounts to 54 pages? What is your general approach to long and lengthy ‘Terms and Conditions’ for legal online agreements? Do you read everything or do you just quickly tick the box? In some cultures, images of the deceased in any form is considered taboo, but what happens when they are online? In future, there will be jobs just for ‘Digital Executors’ that track down all the loose threads and close accounts. I have now started to keep a better record of all my accounts (and passwords) with a particular piece of software (with then only that one password and account details accessible to my next of kin and beneficiaries). This information will also be updated as part of my will. What have I really agreed to? Recently, I commented as an expert for the Age Newspaper on ‘Digital Assets’ mainly about consumers and their digital habits. I now talk to my clients about all the things that they sign up for (including iTunes), Kindle eBooks, software and even mobiles to think about what they are signing up for and are they comfortable with the final outcome should anything happen to them. Keeping track of all your digital assets can be a challenge, but there are several options available to help you keep track rather than multiple pieces of paper. after someone has passed away…. With Facebook, there are several different ways that accounts can be closed down after someone has passed away. They will allow the first person to contact them and this can be anybody (which includes individuals who are not related to the individual or the executor of the will) with evidence of the death in the form of an obituary to delete it or convert it into a memorial site on completion of a form available. Facebook calls this ‘Memorializing Accounts’. It is important to note that Facebook does not allow anyone to log into a memorialized account. I had a close friend last year lose their son and his account became a memorial account where friends and family members could share their stories and grief. If you do need to create a memorial Facebook account, click here for the links. 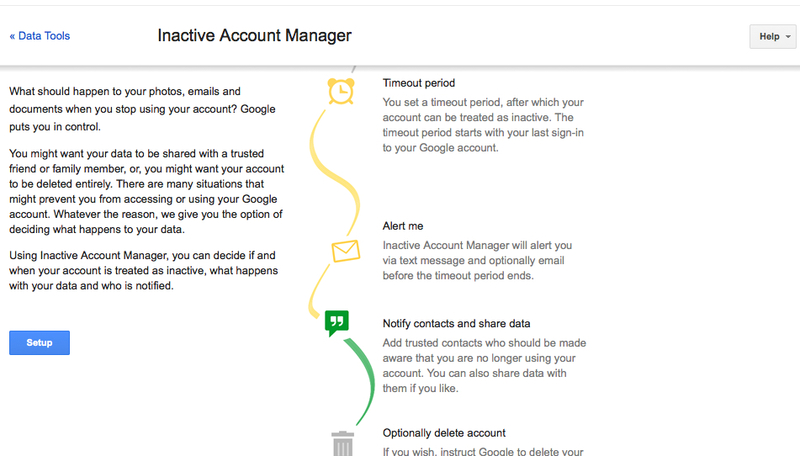 Google decided to create ‘InActive Account Manager’ to start dealing with the growing need of what to do for an person/s ‘digital afterlife’. 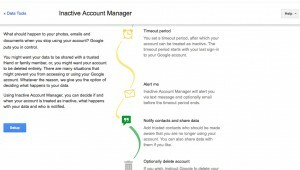 This article released by Google, early last year explains the concept and some instructions on how to set this up. Paypal: PayPal is the most used internet payment and banking service. There are no provisions for the death of account holders. Under their rules, if an account is not accessed for three years, it is closed down. There are a few companies out there that are starting to specialise in dealing with digital assets (so that they are all in the one place). Some of these include: SecureSafe, DeathSwitch and PasswordBox. Here is a template from the ‘Digital Afterlife’ website to help with keeping records of your ‘Digital Assets’. Researching and writing this article has made me more aware of all the regulations and terms and conditions ( I need to be reading) not only for my own benefit but for also educating those around me. Would love to know your feedback on this article. Great post Megan. The biggest asset online we have in our reputation – past, present and future. All of the things you have discussed help to protect different aspects of our online reputation. I totally agree about the digital register – recently I did this after realising I was paying for a few apps that I no longer used! 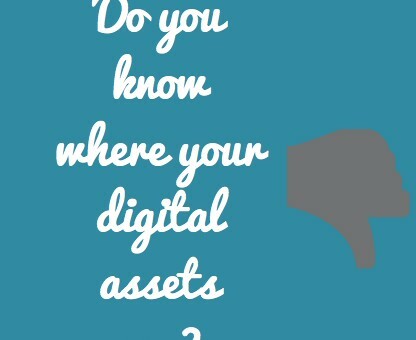 So we can protect our financial assets when we keep on top of our digital products! We should definitely do a presentation together – tech and personal digital assets protection!